If someone asked you for a political forecast what would you conclude? I believe the answers would vary wildly and cover the gamut of the political spectrum. A crucial factor is the Constitution. Other factors may be ideology or personal interests. Generalizations such as fairness, compassion, or some personal interpretation of justice may be significant influences to some. The Constitution is the rule book established by the states and the people of the respective states to control and restrain the federal government. In other words, the Constitution is what governs government. Think about that for a moment. Government itself needs rules, constraints, boundaries placed upon it to ensure government conducts itself accordingly. When man leaves the state of nature and enters into a social contract through an instrument known as a Constitution man is in a state of society. There are certain rights man cedes to government under the instrument. One of the most critical is related to interpersonal adjudication. In a state of nature, if one man wrongs another man, the wronged man may seek retribution. The justice served by the wronged man may far exceed the actual wrong committed in the first instance. In a state of society an impartial third party (judge or jury) would adjudicate this type of situation. The Constitution delegates certain powers to the federal government and all other powers are retained to the states or the people, respectively. There are three parties to the Constitution; the people of the several states, the several states, and the federal government. Since the people are the sovereigns they started with 100% of the powers. The citizens of each state ceded certain powers to their state governments, respectively. Under the Constitution, the citizens through their state ratifying conventions approved the Constitution which delegated limited powers to the federal government (some of which were state powers prior to the Constitution). The citizens also delegated certain limited powers to their state governments through state constitutions (all in existence before the Constitution). The people retained all other powers. Let’s return to the concept of interpersonal adjudication. In the case where two people have a dispute or one party is wronged and accuses the other of a violation of the law, an impartial third party adjudicates the dispute. What happens when one or more state governments, or the citizens of state, has a dispute with the powers exercised by the federal government? Who adjudicates the dispute? We are accustom to the Supreme Court of the United States adjudicating federal vs. states powers (or the peoples’ powers). There is a serious flaw though. The citizens, through their states, created the federal government and delegated limited powers. If the very government created is the final and sole arbiter of all disputes between it and the citizens and the states, it cannot be an impartial and unbiased third party. The very government created by the citizens and the states assumes the power to decide whether its own powers are constitutional or not. Furthermore, consider the birth of the country. The colonies lived under a despotic and tyrannical King. The colonists declared their independence from Britain knowing if they failed they would all be traitors and summarily executed. The colonists fought a civil war and seceded from Britain. The free and independent states along with the citizens of each state created a new government. To believe the very government they created was the sole and final arbiter of the rule book – the Constitution – is both absurd and naïve. Why delegate limited powers if the very entity just created has the power and authority to change the rule book whenever they want without a constitutional amendment. What’s the point of trading one tyrant three thousand miles away for hundreds of tyrants a few miles away. Tyranny is tyranny regardless of geography. Here’s a bit of trivia. From 1937 to 1995 how many laws passed by Congress and signed into law by the President did the Supreme Court overturn? The answer is zero. Fifty-eight years and not a single law passed by any Congress was ruled unconstitutional. It’s hard to fathom. Once the federal government acts unconstitutionally is there any recourse for the states or the citizens of the states. The answer is a resounding, yes! First, the supremacy clause states that any statutory law that is not made in pursuance of the Constitution is null and void. If a statutory law is in conflict with constitutional law, which law takes precedence? Hopefully, you answered; the Constitution. If the federal government disobeys the Constitution and enacts a statutory law not in pursuance of the Constitution, states have a right and a duty to obey the Constitution. Therefore, because states have a right and duty to obey the Constitution they must ignore the law which in essence declares the law null and void. The states have an absolute duty to interpose themselves between the federal government and their citizens to ensure unconstitutional federal laws are not enforced upon their citizens. Secondly, states have the power to submit amendments to the states through an Article V convention. The framers provided two methods of proposing amendments. One method is through the federal government (Congress) and the other by the state governments. In fact, during the constitutional convention of 1787 the first draft out of Committee provided for amendments to be proposed by only the states. It was not until the second draft that the federal method to propose amendments was added. Our current state of affairs borders on tyranny. The federal government assumes powers not delegated to it in violation of the Constitution. But nobody stops them. The voters continue to vote the same people into office. Both parties use the Constitution when it serves their purposes. How many times have you heard Republicans talk about some law or government program that is unconstitutional and then do absolutely nothing to repeal it? By then the next constitutional violation is at hand and Republicans are yelping about it again but do absolutely nothing about it when in power. How many unconstitutional laws and/or programs were repealed under Bush 43? Because both parties, all three branches of the federal government, and many Governors and state legislators simply care more about winning the game then following the rule book. In other words, they are cheaters. They take an oath to uphold the rule book and they immediately begin violating it. They simply cheat and eschew the rule book to win. Consider that next time you cast a vote for a candidate. I’m hopeful we are near the end of this long train of abuses and usurpations. If not my political forecast is Partly Constitutional with a Good Chance of Tyranny. I’m channeling a little Jimmy Buffet today thinking about his song A Pirate Looks at Forty. I know, given what I typically write you must be thinking I’ve finally lost it. But the song is one of my favorites and has a great line. You can listen to the song here, but this is the line. Well I’ll be looking at fifty in a couple years and will simply say I’m a blessed man. I have a beautiful wife and five children. I make a good living. Indeed, I am fortunate to have been blessed by God for what I have in life. I have also made so many mistakes and poor decisions I’ve lost track of them. I’m about as imperfect a person that exists on this earth. I can live with that. Perhaps Mark Kreslins is insightful when he refers to me as semi-competent. I’ll add that I often feel I’ve arrived too late. Not because I’m a pirate. Nor do I wish to plunder. It would be pretty cool to have a canon though. I’ve arrived too late because I think I’m a relic in today’s political landscape. A middle-aged man holding on to principles so near and dear to my heart that I am disheartened so few of my fellow countrymen treasure and cherish the ideals set forth by our founding. If the Declaration of Independence were written today the founders would be ridiculed and demagogued by the main stream media and other political operatives from both parties. The Declaration established the original American Dream. That dream was not to own a house. The dream was not to claim the property of others with the government acting as the third party agent executing the transaction. The original American Dream was to simply have an opportunity to live your life free of rulers, tyrants, and despots. To live a life free of oppression. To be free to worship as you wish or not worship at all. To be secure in your person and your possessions. To be free to pursue whatever you want to do in life. To associate with whom you choose. To transact in commerce freely with others for the mutual benefit of both parties. To enjoy the fruits of one’s labor. The absolute right of property. Undeniably, these ideals have faded like a well-worn pair of blue jeans. Individual responsibility has been abrogated to government and political parties. Liberties have been trampled. Freedom is no longer a priority. Instead, liberty is freely traded for the false sense of security and entitlement. Security that can never be provided nor an entitlement that any person has a rightful claim to. A moral decay is rotting the country from the inside out. A few short years ago I had an epiphany. I realized that government, in all its machinations, is not and cannot look out for my interests, rights, or liberty. Government was instituted by man to protect our unalienable rights, liberty, and property. That is the purpose and the end of good government. In exchange, the people consented to government certain limited powers to better protect our unalienable rights. The people, through their states, created a Constitution establishing a limited government. Elected official were expected to govern, not to rule. Congressmen are agents of the people with certain limited powers enumerated in Article I Section VIII of the Constitution. As agents they are to act as our fiduciaries and public trustees. As agents they do not have the powers delegated to them to then abrogate their responsibilities to the executive branch, agencies in the executive branch, or to the judiciary. Likewise, the executive – the President – has absolutely no authority to act outside the constraints placed upon him or her under the Constitution. Lastly, the judiciary was never intended to be the final arbiter and ruler on all things Constitutional, much less legislate from the bench. As I said early, I believe I’ve arrived too late. In one aspect that applies to me epiphany a few years ago. During the healthcare town hall meetings in 2009 I was preparing signs. My five year old son asked me what I was doing. I replied, “I’m trying to fight for your rights and liberty so you can grow up and live freely.” The questioning about that went back and forth, but with a five year old it can’t go that far. Two months later while I was working on a U.S. Senate campaign it dawned on me I gave my son a cowardly answer. It came to me one night why I answered my son that way. The truthful answer is when I’m having a conversation 20, 30, or 40 years from now with my adult children or grandchildren and they ask me “Dad or Granddad, what happened back then?” In my reply I’d explain it to them. Then they’d ask me “What did you do about it?” In my reply I’d say “I voted against it”. When they stare at me with that puzzled look and say “that’s it! That’s all you did” I couldn’t live with myself. It was at that time that I realized I had to do something. So, that is what got me started. I realize I’ve arrived quite late to the party. But I also realize I have a duty, an obligation, to myself, my family, my children and my grandchildren. The other aspect of arriving too late is that I often feel I would have been quite at home if I were living during the revolutionary period. When Jimmy Buffet said “two hundred years too late”… I feel like I should have been here in the colonies a couple hundred years or so ago. It would have fit me well, like a well-worn pair of blue jeans. Our union, established upon bedrock principles of individual liberty, natural rights, and self-governance may be in its twilight. Generations have been conditioned to not only accept an all-powerful, centralized government and a top-down planned economy, but to sustain and preserve it at all costs. Those costs include subjugating individual rights and liberty to an aristocracy primarily concerned with furthering their own ambition and avarice. The aristocracy subsists on a rotting umbilical cord connected to complacent citizens willing to accept the status quo. The founders understood human nature and the reasoned self-interest that drives an individual’s pursuit of happiness. The founders had faith and confidence that the common man was rational and could function autonomously. Those beliefs have been systematically eroded and replaced by a brainwashed populace idolizing the aristocracy to the detriment of the individual’s self-interest, liberty, and unalienable rights. Arguments are posited that man is not capable of self-governance. Man is not capable of exercising his own judgment and pursuing his dreams. Man is not capable of choosing with whom he interacts and which goods and services he chooses to procure. Man is not capable of acting rationally and autonomously. These arguments are patently absurd. The arguments are self-defeating and circular. If man is incapable of self-governance and self-direction then how is man capable of governing or directing others? Moreover, the argument implies there are certain individuals amongst us that are better suited or more capable of governing than ourselves. This arcane thinking leads the populace to idolize a select few amongst us. To declare we are not capable of self-governance and self-direction, and to sanction the few to exercise dominion over the many is to subject oneself to tyranny and despotism. The ruling class has the audacity to claim they’re acting in our best interests, out of compassion for others, or for the children. It is impossible for a small cabal of bureaucrats to govern 300 million people effectively and efficiently. It is insulting when the ruling class claims moral superiority because government is compassionate by taking care of the people. Even President Bush’s “compassionate conservative” label was enough to make me ill. Compassion is only virtuous when voluntary. Government compassion is dispensed through force and coercion. The threat of fines, imprisonment, or even at the barrel of a gun is the modus operandi to keep the subjects in line. Is it compassionate when government confiscates private property to bailout automotive or financial institutions? Is it compassionate when government takes your hard earned income and gives it to an abortion provider when you consider abortion morally repugnant and against your conscience? Is it compassionate to force younger generations and those not yet born to bear the debt burden from decades of profligate spending and incompetent monetary and fiscal policies? Is it compassionate when central bankers engage in outright money printing – currency debasement – which erodes the wealth and purchasing power of all Americans that save their surplus production? The founders did not fight a civil war with and win independence from Britain just to trade one tyrant three thousand miles away for few hundred tyrants a hundred miles away. No, the fight for independence transcended historical reasons for war. The moral and philosophical statements in the Declaration of Independence formed the basis for civil society, the relationship between the individual and government, and the country’s governance in general. The most important moral and philosophical statement is the individual is sovereign with certain unalienable rights. Today we are so far removed from the moral and philosophical beliefs that set America apart from any nation-state in the history of mankind. Americans think in four year presidential election cycles. Issues no longer revolve around individual rights, liberty, and the Constitution. Rarely do we hear any candidate discuss authority and whether authority belongs at the federal or state level according to the Constitution. Instead, voters are subjected to political kabuki theater where votes are bought and sold with promises of largesse and reforming this or that program. Tinkering with public policy, monetary or fiscal policy, and politicizing the tax code are used as bait to attract voters — the unwitting yet complicit prey — that take it hook, line, and sinker. The political arena abetted by the main stream media is analogous to the bread and circuses of the Roman Empire. As author Robert Heinlein said, “Once the monkeys learn they can vote themselves bananas, they’ll never climb another tree”. Reform is simply political speak for institutionalizing laws and regulations that do nothing more than assault your wallet, your rights, or both. The tax code is politicized to gain favor with certain constituencies in return for political contributions to ensure the incumbent is re-elected. Health care legislation obliterates the very basic relationship between individuals and government as the legislation requires compulsory purchase of an insurance product. Financial reform legislation did nothing to address the failures in the home mortgage industry and the financial industry. Both pieces of legislation were thousands of pages long and added more rules and regulations favoring certain constituencies and harming the individual. The simple truth is the country is well past the point where tinkering with this policy or reforming that program will achieve any real transformational change. Whether a Republican or Democrat is elected as the next President the country will continue the same destructive policies. The only variation will be the speed of destruction. Undoubtedly, some believe that if only we can get our guy elected, or take back the White House, things will miraculously change course and all will be well. Two years removed from the historic mid-tem election and nothing has changed. The hope that Tea Party candidates elected to the House and Senate would stand up against the status quo has vanished. The House Republican leadership folded like a cheap tent when it came to the debt ceiling debate. The country is in need of profound change, not sophomoric change. The profound change must come from the people demanding change in our representatives. The people must stand up for principles, not people or parties. While every candidate may not be perfect, we as voters must demand more from our representatives. Every elected official swears an oath to uphold and defend the Constitution. As soon an elected official removes their hand from the bible they start violating their oath. We the people want to be governed according to the Constitution. We want our personal and economic liberties restored. We want to be treated at citizens not as subjects. We don’t want to be ruled. We don’t want to be forced to buy a good or service against our will. We don’t want our property taken and used to bailout private companies. We don’t want the banking cartel to debase our currency and destroy our hard-earned savings. We don’t want our children and grandchildren born into debt slavery. We don’t want hundreds of thousands of laws, rules, and regulations. We don’t want to be told what type of light bulbs to use, which cars we can drive, and how much water we can use in our homes. We yearn for less government and more freedom. A word of caution as my question isn’t nearly as brilliant or insightful as the one asked by ABC’s George Stephanopoulos about contraception. Nor is my question asked to uncover intimate and personal details of a candidate’s marriage. Unfortunately, the main stream media would consider my question shallow and contemptuous; beneath the dignity of a candidate for president much less the current president. Sadly, but without remorse, my career aspirations as a journalist for ABC or CNN vanish before my eyes. But I digress. Government revenues in 2011 were roughly $2.2 trillion. Government spending falls into one of three buckets: $2.4 trillion for entitlement programs and debt service, $891 billion for non-discretionary military, and $496 billion for discretionary spending. Over what period of time and exactly how much will you cut from each of those three buckets to balance the budget? Most of the Republican presidential candidates have no intention of cutting non-discretionary military spending. 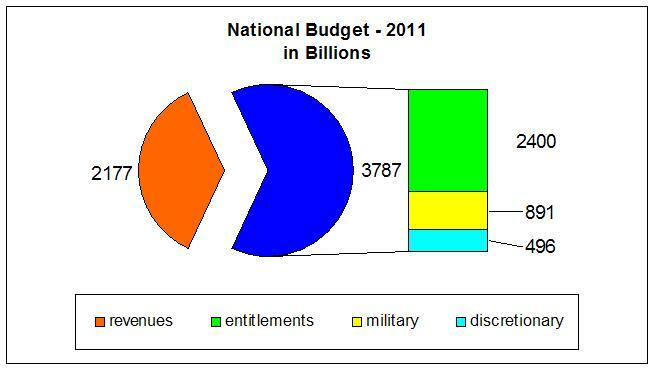 Assuming every candidate eliminated all $496 billion of discretionary spending a $1.091 trillion deficit remains. To be generous let’s assume federal revenues increase by $400 billion. The deficit would stand at $691 billion. Over ten years the debt would grow from $16.2 trillion to $23.2 trillion. Living on a lunar colony is looking better by the day. I’ve asked this question to Republican congressional candidates and not a single one has provided a sufficient answer. In fact, not a single candidate has yet to provide a solution. The question was posed under ideal conditions that the candidate had all the power to enact changes before factoring in the two party system, ideology, special interests, power struggles, and back room deals. Voters in the 2012 election should set their expectations accordingly. The simple truth is there isn’t a single Republican or Democrat candidate that will address this problem. Both parties benefit from the status quo and have no intention of committing political suicide by making the necessary, difficult decisions required to balance the budget within a year or two much less four or five years. This is our stark reality. It is surreal. My question to you is what are you going to do about it? Are you going to vote for the status quo? Are you going to vote for a candidate that will increase the debt by $4 trillion over four years instead of staying with the incumbent President and incurring perhaps $6 trillion or more over the next four years? As the ruling class fights in the sand box like petulant children it is we the people that will feel the onslaught from economic Armageddon. The change I’ve been hoping for is in we the people. The one question for the voters is will you continue to vote for the status quo?